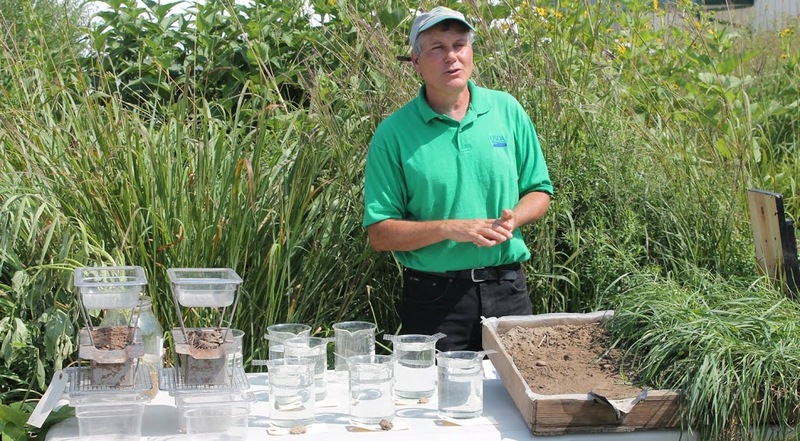 USDA NRCS Plant Materials Specialist Paul Salon spearheaded development of the new Soil Health Seminar Center for the August 11-13, 2015 Empire Farm Days in Seneca Falls, NY. The Center will feature two speakers and a farmer panel each day plus cover plot demonstrations, a rainfall simulator, interseeder, and more. Seneca Falls, NY. The New York State Interagency Working Group for Soil Health will host two speakers and a panel of farmers daily starting at 9:30am at the new Soil Health Seminar Center at Lot 922 at Empire Farm Days, August 11-13, 2015, at Rodman Lott and Son Farms in Seneca Falls, NY. The trio of 45-minute sessions will cover a variety of soil health practices including cover cropping, reduced tillage, and nutrient management. Field demonstrations associated with the Soil Health Seminar Center include cover crop plots established by Seedway and King’s AgriSeeds. In addition, the USDA NRCS Big Flats Plant Materials Center in cooperation with Rodman Lott and Son Farms will have an innovative companion seeding of Dutch white clover and dwarf perennial ryegrass in soybeans using herbicides to stunt the cover crops until canopy closure. A rainfall simulator and the Penn State University-designed interseeder are part of the new Center exhibits. Cornell Soil Health Program personnel will be at the Center to answer questions about soil health testing and management. ‘This new Soil Health Center at Empire Farm Days will be a great new resource for farmers interested in how they can improve their soil to enhance crop production, water quality, and resilience to extreme weather events,’ says USDA NRCS Plant Materials Specialist Paul Salon. ‘The new Soil Health Center is one more way Empire Farm Days can offer the latest information, equipment and techniques all in one location to help farmers and agribusinesses not be left behind by the fast-changing agricultural environment,’ says Empire Farm Days Manager Melanie Wickham. Empire Farm Days is a 300-acre event with educational seminars, field demonstrations, agricultural and outdoors information and vendor booths, equipment displays, live animals, and rural life exhibits. Parking is $10 per vehicle. Learn more at empirefarmdays.com. GENEVA, NY. 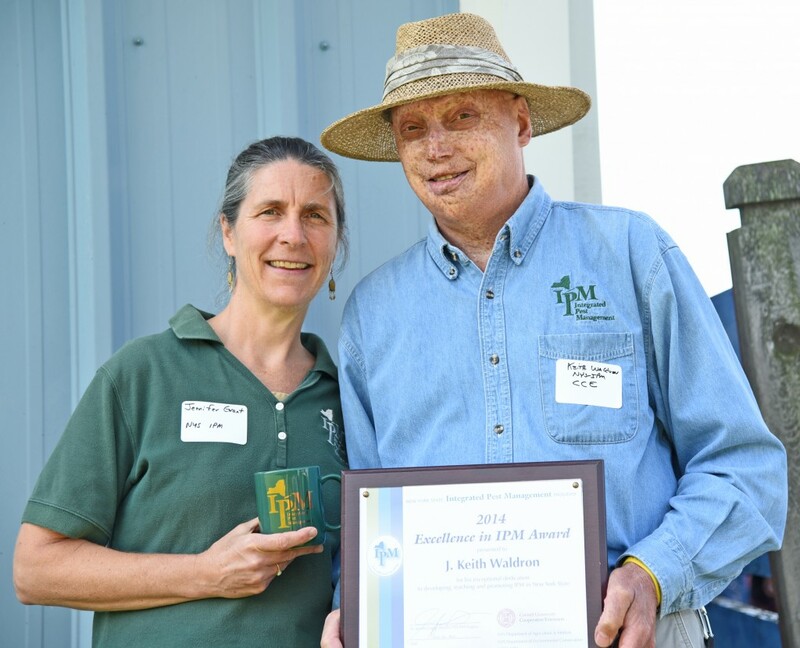 July 16, 2015: Keith Waldron, livestock and field crop specialist with the New York State Integrated Pest Management Program (NYS IPM), has earned the program’s “Excellence in IPM” award. The award honors Waldron for 30 years of service to farmers who collectively contribute more than $3 billion to New York’s economy. He received his award on July 16 at Cornell University’s Aurora Farm Field Day in Aurora, New York. Field crops and livestock — teaching better ways to keep them healthy and productive — are Waldron’s stock in trade. And whether he’s working with growers, industry reps, or a farmer’s next-door neighbor, his dependability, responsiveness, and ready humor have earned him broad respect as an honest broker, according to Gary Bergstrom, professor of plant pathology at Cornell University. One innovation: hands-on teaching materials for classes held in farmers’ fields — an approach that makes IPM principles so much easier to understand. In fact, one nominator recalls an aphid infestation found during class time, just in time to save his crop. “Frankly, we are years overdue in recognizing Keith Waldron for his many important contributions,” says Bergstrom. Bergstrom cites a second Waldron innovation, striking in its simplicity: setting up a series of conference calls among extension educators and researchers statewide throughout each growing season. “This has done more to build a sense of shared community among field crop personnel than anything I’ve observed over the past 20 years,” Bergstrom says. Learn more about IPM at NYSIPM.cornell.edu.